""" keywords'/> "" " A Lesson From a Tragic Tale of a Failed Dreaming Actor | Best Actor Academy-The Monster Of Free Acting Tips ""
Swapan Kumar, like most actors, was passionate, creative and excited to fulfill his dream and get his career off the ground. He felt a surge of excitement when he realized that acting is more than a hobby, and he could do acting as a profession and be Salman khan or Randhir Kapoor. There was just no stopping him! He was ready. Because he thought that’s all it takes to be a professional actor. A passion! Okay, Dream Boy realized how silly he had been. He should probably take an acting class or something. He had passion, he had been properly trained with all the information he needed to be a professional actor (after all, he took BJAS acting class) and so… he said “watch out Bollywood- Swapan Kumar is here"! Well, nothing happened.. Swapan Kumar was stumped. He took an acting class. "Why wasn’t Karan Johar or Sanjay Leela Bhansali, banging down his door, script in hand, offering him the lead?… Or even a supporting role?" "Oh, I see!" Swapan Kumar realized what the problem was. Portfolio (Headshots). Didn’t he need to get those if he was going to be a professional actor? So he went out and spent Rs. 25,000 on headshots. And Swapan Kumar was really excited because the photographer told him that he could now definitely get roles in Bollywood and in TV serials. So Swapan Kumar got 1,000 prints paying extra Rs. 5000 for the package. He remembered what the photographer had told him; get registered with a few good artist coordinators and had given him names. But still nothing. No Karan Johar. No, nobody. And he was down by a total of approx. Rs. 2,60000 (Two Lakhs sixty thousand; $ 4000). He had to use all the tricks to get this money from his parents and friends. He was starting to think maybe being an actor wasn’t such a good idea. The doubt started to swell. His family started to tell him he was nuts for doing this and he should just “stop chasing rainbows” and get a “real job”. He sunk further! Why wasn’t Swapan Kumar’s acting career taking off? After all, he had PASSION! He was focused. He took an acting class and he had all other things. Why Swapan Kumar Is failing? Swapan Kumar has the passion (which is essential). He does have headshots, show reel, monologues filmed and registered with top coordinators (few out of this also essential). He did take an acting class (gotta have that too). However, our स्वप्न कुमार- Dream Boy knows NOTHING about how the business of professional acting works. He didn’t know how to develop confidence which he was losing due to self-doubt and shattering dreams. He has no idea how the business of Bollywood and TV industry and how to develop contacts to get work. …Some consistent work in projects so he can make a living as an actor. OK sir, I'm too an aspiring actor So, what should I do? 1. To understand the business of “the business” and how making your business of acting, successful. You’ll keep having the same experience year after year wondering why you’re not getting ahead. You’ll most likely end up stuck in some other job you hate, getting a few small parts a year (if you’re lucky) and wondering why you’re stuck at that level for what seems like FOREVER. Don’t panic! There is a solution. You WILL NOT be the actor in a bottle of self-doubt and self-pity. You WILL fill in the gaps of essential knowledge strategy that you’re missing. Get the ALL the essential information you need to get started on your acting career the RIGHT way. Make that promise to yourself right now. 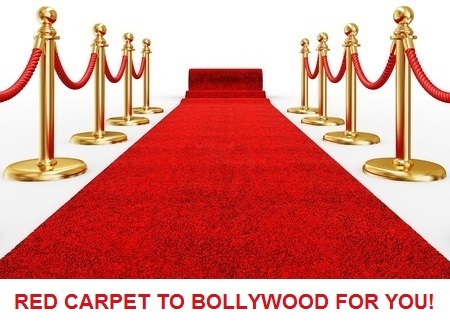 And You will be one step closer to a Bollywood's "The Red Carpet”!